The Firebird's Finery Set Dungeon is located in Act II, the Desolate Sands. Take the Archives of Zoltun Kulle waypoint and walk backwards toward the entrance. Exit into the Desolate Sands and head eastward, crossing the bridge. On the other side and slightly to the north, the entrance of the Firebird Set Dungeon will open if you have the 6-piece bonus active. The Firebird's Finery's two unique Primary Objectives are to: 1) Ignite or kill 20 enemies within 3 seconds 6 times; and 2) Hit 50 different enemies with the Meteor that revives you. The Firebird's Finery Set Dungeon is a moderately sized Ice Caves tileset that starts off with a linear tunnel, and later splits into a 8-shaped section. 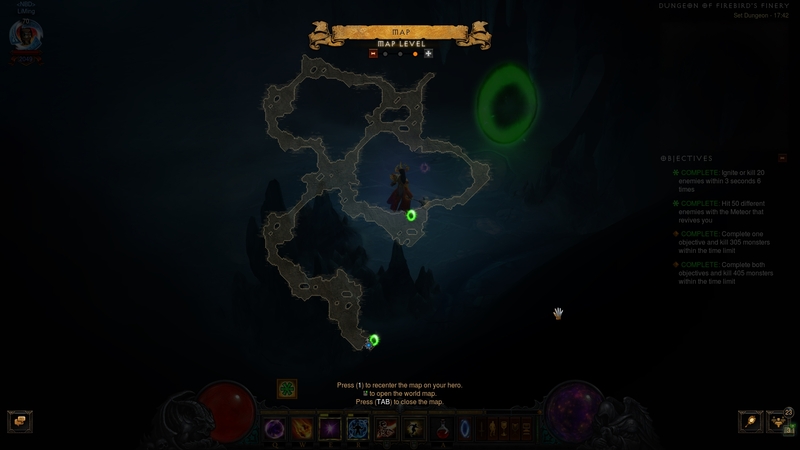 A proven attempt path is to clear the starting corridor (getting as much of the two Objectives as possible there), and then cleaning up the remaining circular tunnels one by one (left first, right second). Amputators, Ice Porcupines, Glacial Monstrosities — while the first two are of the "porcupine" enemy type and the latter is of the "yeti" type, they all share a single battle strategy: firing hard-hitting, Cold damage projectiles at you. They will be countered with gearing, as explained below. Guardian of Finery — the unique enemies of the map. They resemble Act III's Glacial Colossus trash, but also have the Frozen affix. These elites are the key to completion of this map, since their melee attack is the only reliable source of non-Cold damage in the map, able to proc your cheat death Meteors (read on the tactics below). The first key component of mastering this Set Dungeon is equipping or cubing Talisman of Aranoch. All but one of the enemies' attacks in this challenge are strictly Cold damage, and you will be taking advantage of this. Go in with the amulet in place, and otherwise completely glass cannon — taking the namesake passive, dropping all toughness-related Paragons and gems, even dropping entire gear pieces that might be unnecessary extras for the dungeon (belts, bracers, offhands with high Vitality). If you notice you are not getting oneshot with regularity by the elites' melee attacks, exit the dungeon and drop more gear and/or toughness stats. The second key to completion of the 2nd Objective (and it will also help with the 1st, so two birds with one stone) is to lure a large pack of trash — mostly Amputators, but whatever you can get really — right next to a Guardian of Finery elite, and then waiting for its strong Melee attack. One or two of these should be enough to proc your Firebird 2-piece cheat death, and summon a Meteor from the sky. If pulled off correctly, this will clear the 2nd Objective in two (or even one!) Meteors. Since the Firebird cheat death has a minute-long cooldown, you really need to do this ASAP. The Firebird's Finery Set Dungeon is dependent on enemy spawn RNG, but thankfully not as much as other offenders (Helltooth and DMO). The dungeon is ususally abundant in trash, especially in the starting area, allowing you to knock out the 2nd Objective and a large portion of the 1st within the first two minutes. Still, as a rule of thumb, if you are already at the intersection area and have not completed the 2nd Objective as well as 4/6 of the 1st Objective, you might be better off restarting and saving yourself the hassle.